"Both beautiful in presentation and taste, this salad uses fresh berries in summer (strawberries, blueberries, raspberries, or blackberries), and orange segments in winter. Anytime of year this composed salad will bring rave reviews." Lightly oil the grill grate. Grill chicken 8 minutes on each side, or until juices run clear. Remove from heat, cool, and slice. Meanwhile, place pecans in a dry skillet over medium-high heat. Cook pecans until fragrant, stirring frequently, about 8 minutes. Remove from heat, and set aside. In a blender, combine the red wine vinegar, sugar, vegetable oil, onion, mustard, salt, and pepper. Process until smooth. Arrange lettuce on serving plates. Top with grilled chicken slices, strawberries, and pecans. Drizzle with the dressing to serve. 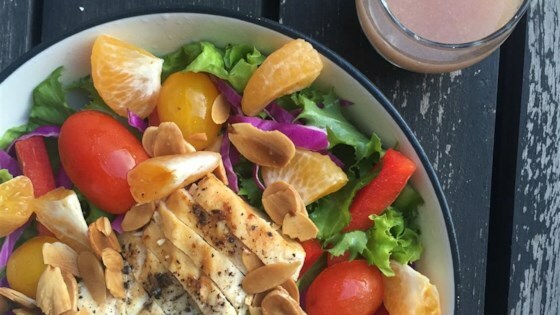 An amazing main dish salad that stars grilled chicken and fresh seasonal fruit.